The Freebird is a 1.5" wide, double-layered collar best fitting medium to large sized dogs. The top 1.25" wide layer is handset with black-silver metal peace signs with wings and black gemstones. You have the option to add a second D-ring in the back. 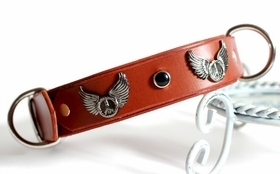 Choose from 5 leather collars. All of our collars are proudly handmade using fine quality materials in the U.S.A.